We are back from vacation now and trying to play catch up on laundry, mail, work, etc. Boy, does reality set in quick, ha?!! It is freezing here...only in the 40's, yuk! I also have a quick little project to share with you. I wanted to play in a couple challenges and try and get my mojo back for crafting, ha!? I started with Jaded Blossoms Candy Caddy metal die for the treat holder. The pattern papers I used are from a Recollection paper stack I have had for a while. 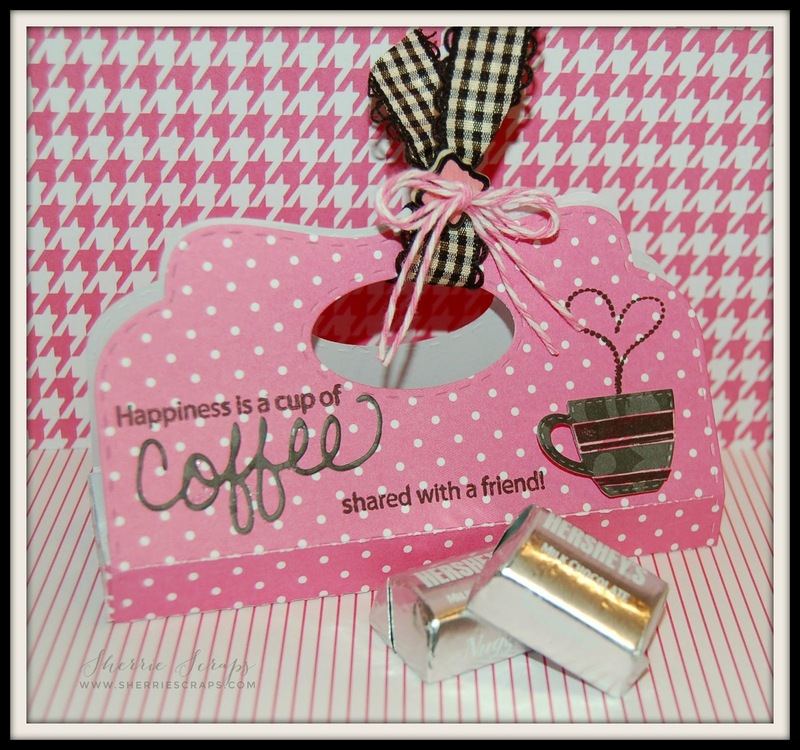 I stamped the sentiment using My Creative Time's All You Need Is Coffee stamp/die set. This set is so fun! 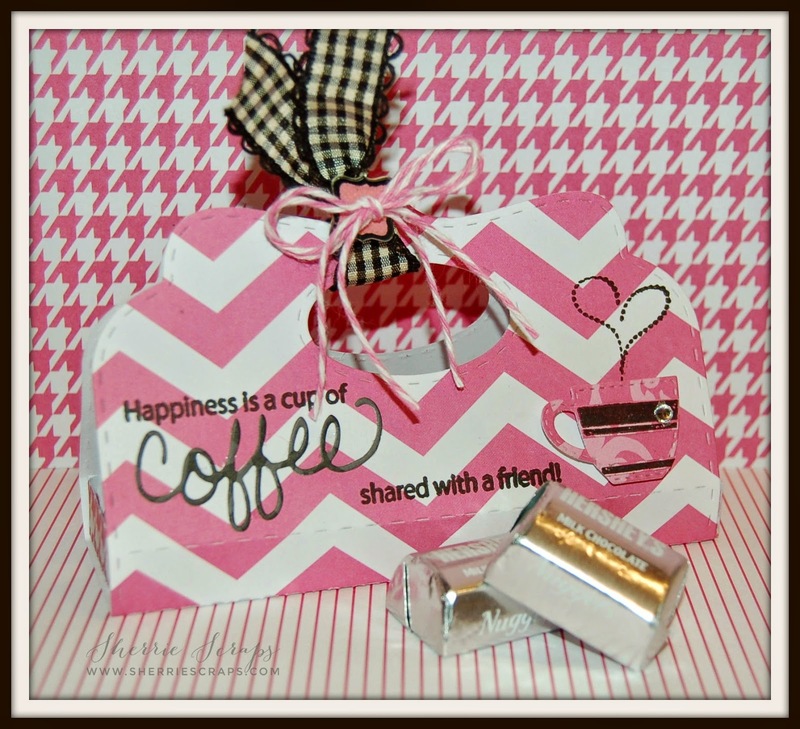 It has such cute sayings and fun little dies to match :) The coffee mugs are from this set to...cute, ha? I added some fun ribbon and button all from Making Memories. I also used Trendy Twine's tickled pink to tie on a twine bow. I finish by filling the little slider box with yummy chocolates! Who doesn't like chocolate with their coffee?! Yum! So glad to hear you had a fabulous vacation and you got to meet up with some bloggie friends, that is so fun! 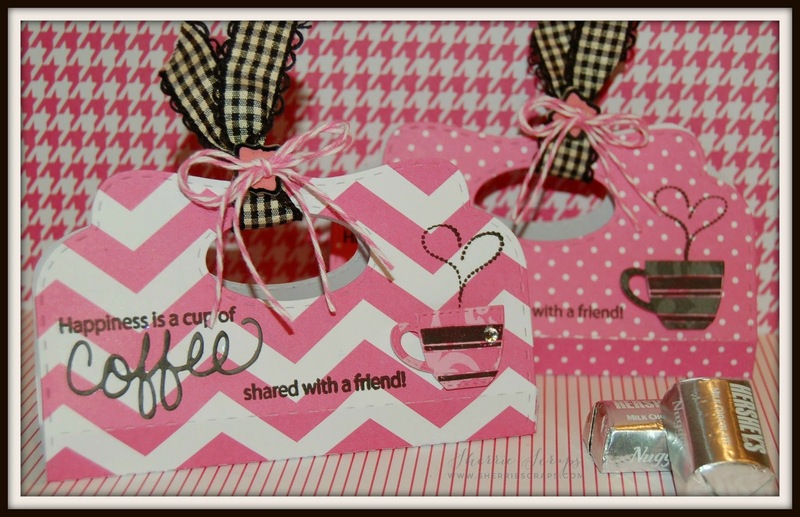 Your project is adorable, I especially love the pink and the papers! Fun ribbon you used too! Oh Sherrie this are fabulous and from a coffee lover, the sentiment is so true especially in the morning LOL!! Great photo of you ladies and how fun to have gotten together:) TFS and for joining us over at Decorate to Celebrate. I was over the moon happy seeing you and the girls again!! So glad you all had me along!!! Glad you had a great vacay!!!!! I loveeeeeee those boxes!! LOVING the colors and the mugs!!!!!!! Welcome home, Sherrie!! I'm glad you had a great time!! What a fabulous picture...how fun to get together with crafting buddies!! I hope you will share some of your trip, too!! Your treat holders are adorable!! I love the papers you used!! The little coffee cups are so cute!! And the ribbon is fabulous!! Love these my friend!! Sherrie ~ these are fabulous and beautiful! I love all the products of course but the papers are so perfect too! Well I so get the reality thing ~ sigh! Well you look like you had so much fun with these ladies!!! I bet you all had a fun time!!! Super cute project Sherrie, glad you enjoyed your vacation!! Super fun treat!!! I love the sweet pink! Fun treats!! Awesome pic!! Welcome home Sherrie. Sounds like you had a wonderful time. What a great thing to get to meet up with fellow bloggers/crafters. So lovin your treat holder. The papers are so girly and the design so unique. My daughter had a baby girl at 7:30 p.m. Tuesday, Oct. 14th. Everyone is healthy. Congrats on that new little bundle! How exciting:) Thanks for popping in! Have a super evening and again congrats Grandma! Hey Sherrie!! I love your gift box! Its so cute. Plus the fact that it holds chocolate!! Totally amazing. Nicely done. Thanks for joining us over at the DoubleClick Skittles Challenge. Such cute gift boxes! So glad you were able to get together with friends! What a fun treat to be able to catch up with some bloggy friends! That's awesome! I totally adore your treat holders! So so cute! Looks like you had an awesome time on your vacation. I love the candy caddy. You have inspired me to use those MCT stamps and dies. I haven't been in my craft room much. What a great picture ! Sounds like you had a awesome time on vacation ! This projects is perfect ! Great design and love the patterns ! How super fun to meet up with these awesome ladies!! GREAT picture!!!!! AWESOME project Sherrie! LOVE the gorgeous paper and AWESOME use of the MCT stamps and dies! Oh that is so cute!!! Thanks so much for participating in our DECORATE TO CELEBRATE challenge!! Hope to see you again for our next challenge! !